Vitamins are vital for proper nourishment of skin. Deficiency of certain vitamins results in rough, dull and scaly skin. To fulfill the deficiency of these vitamins, instead of relying on chemically prepared vitamin tablets, it is better to go with their natural sources in purely natural forms and try to eat foods rich in those vitamins. In the following lines, we are going to discuss top 5 vitamins with their natural sources. 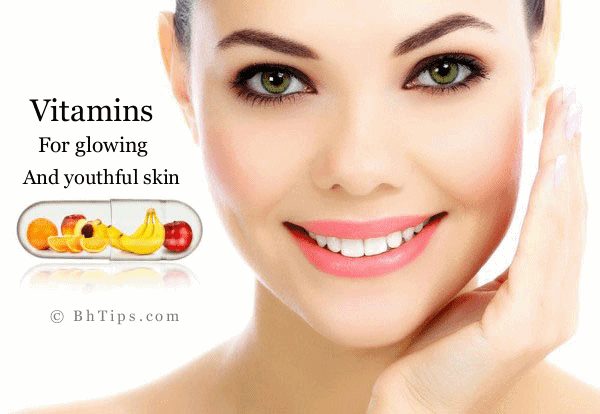 Let's know that how these Vitamins help to get healthy, glowing and youthful skin. Vitamin A is a good antioxidant and play an important role also very important for proper growth and nourishment of skin.It also reduce the signs of aging and give you younger looking skin.Vitamin A prevent the appearance of fine lines and help a lot for removal of dead skin cells.Vitamin A reduces the production of acne and results in smooth and clear skin.It also helps in repairing of damaged skin cells and enhances the growth of new cells and tissues. Deficiency of Vitamin A results in rough and dry skin. Rich Sources of Vitamin A are dark green and yellow vegetables and yellow fruits. Some fruits and vegetables including broccoli spinach, turnip greens, carrots, squash, sweet potatoes, pumpkin, cantaloupe, and apricots are good sources of Vitamin A. Besides them Animal sources of Vitamin A are liver, milk, butter, cheese, and whole eggs. Vitamin B specially Vitamin B3,B6 and B12 are important for healthy glowing skin.These vitamins are considered very effective to fight against acne.These vitamins also improve hormonal balance and keep your skin hydrated. Vitamin B3 is found in protein-rich foods. The most common protein rich foods are meats, fish, brewer's yeast, milk, eggs, legumes, potatoes and peanuts. Rich Sources of Vitamin B6 are liver, meat, brown rice, fish, butter, wheat germ, whole grain cereals, and soybeans. Vitamin B12 is found in liver, kidney, yogurt, cheese, eggs, dairy products, non-fat dry milk, fish, clams, oysters, salmon, sardines. Vitamin C is considered best for elasticity of skin and prevents signs of aging.Vitamin C is essential for the production of collagen and responsible for elasticity of skin. Lack of collage results in premature aging,wrinkles and rough skin.Vitamin C is also an important antioxidant and it is helpful in neutralizing free radicals.Vitamin C increase the body's ability to repair tissues so wounds heal more quickly.Vitamin C also protects the skin from harmful effects of ultraviolet sun rays and gives you a healthy and glowing skin. Vitamin E is also a good antioxidant and helps in production and growth of new skin cells and tissues.Vitamin E promotes healthy skin by protecting skin from ultraviolet radiation.Vitamin E protect the body against the damaging effects.Vitamin E also help a lot in treatment of sun damage,skin wrinkles,scars and age spots.Vitamin E reduce aging signs and give you a youthful and glowing skin. Sweet potatoes and mangoes are rich in Vitamin E. Several oils including sesame, sunflower, peanut, safflower, olive, soybean and corn are good sources of Vitamin E. Nuts also contain sufficient levels of Vitamin E. Walnuts, Brazil nuts, hazelnuts, sunflower seeds and almonds(badam) are excellent snack foods. Butter, margarine, eggs, wheat germ, wheat germ oil, soya, yams, spinach(palak), broccoli, corn, avocados and fortified cereals are other good sources. Some green vegetables also contain small amounts of Vitamin E.
Proper intake of Vitamin K is also important for youthful and healthy skin.Vitamin K is very helpful for treating dark circles under eyes, bruises, puffiness under eyes and skin discoloration. Green leafy vegetables are good sources of Vitamin K. Rich sources of vitamin K include kale, spinach(palak), parsley(Ajwain Kharasani ), turnip greens, mustard greens, collard greens, dried basil, Romaine lettuce, Swiss chard, thyme, broccoli, Brussels sprouts, asparagus, green beans, cauliflower, tomatoes, cabbage, celery, oregano and kelp. Some other good sources of vitamin K include black pepper, cloves(long), carrots(gajar), green peas, bell peppers and summer squash. A good amount of vitamin K is also found in kidney beans, strawberries, pears, papaya, pumpkin seeds, cow's milk, avocado, miso and cayenne pepper.It is also found in dairy products, corn and soya oil, liver, eggs, fish, seaweed, lentils, potatoes, nuts and alfalfa.